A Broadstairs eight-year-old who has a feeding tube and a ‘mini button’ stoma has donated 25 special teddies to help other poorly children. 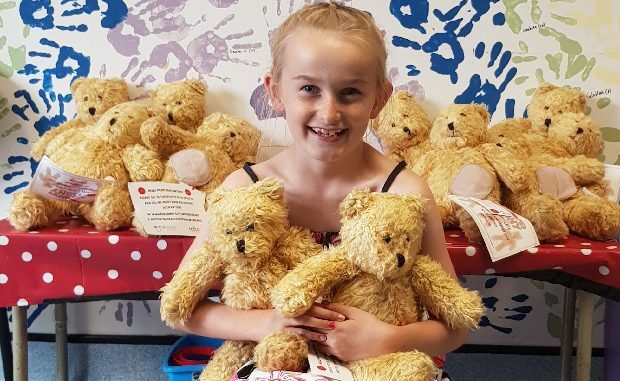 St George’s primary pupil Olivia Welsh was determined to raise cash for the bears after receiving her own Buttony, a special bear with a stoma on its abdomen, just like the toy’s young owners. Olivia was born with a severe feeding disability, when parents Sue and Phillip tried to feed her she couldn’t swallow properly and aspirated. Sue said: “She was also a ‘silent choker’ which made things even more stressful, so she had to be watched 24/7. “Olivia also has hypermobility and other medical problems which have been hard for her. She has been fed via a feeding tube since she was 3 months old and currently has a mini button in situ. Family support has helped through the tough times. Sue said: “Olivia has two older siblings, Lauren, 17, and Thomas, 13, who have been absolutely brilliant in helping to care for her. Although they have had to sit on the sidelines many a time whilst she has been in hospital, they never complained once, just shown total love, care and compassion. We are so proud of them. It was during a trip to the Rainbow Ward when Olivia’s button had popped that the family found out about charity ‘A bear named Buttony.’ The group makes and donate bears to poorly children who have stomas, like Olivia. 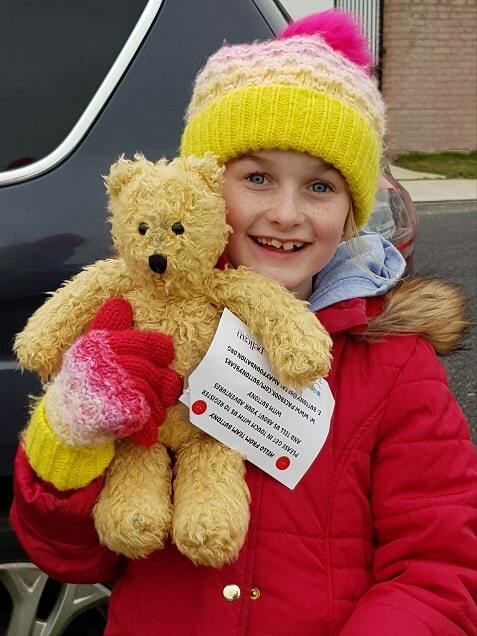 Sue said: “We applied to get a bear for Olivia who was beginning to struggle with a school change and having medical issues. It really brightened her up and she really appreciated that it had a button too. In February Olivia carries out her sponsored walk from Broadstairs to Ramsgate and raised a brilliant £720 for the charity. The cash funded 25 bears with 10 being sent to hospitals across the country and 15 which Olivia delivered to the Rainbow Ward this week. Sue said: “Olivia did brilliantly and had some great support from her friends. The bears will be given to children who have feeding tubes, Ileostomy or Colostomy.